With the mechanics of flight secured, early aviators began the tasks of improving operational safety and functionality of flight. These were developed in large part through the use of reliable communication and navigation systems. Today, with thousands of aircraft aloft at any one time, communication and navigation systems are essential to safe, successful flight. Continuing development is occurring. Smaller, lighter, and more powerful communication and navigation devices increase situational awareness on the flight deck. Coupled with improved displays and management control systems, the advancement of aviation electronics is relied upon to increase aviation safety. Clear radio voice communication was one of the first developments in the use of electronics in aviation. Navigational radios soon followed. Today, numerous electronic navigation and landing aids exist. Electronic devices also exist to assist with weather, collision avoidance, automatic flight control, flight recording, flight management, public address, and entertainment systems. Avionics is a conjunction of the words aviation and electronics. It is used to describe the electronic equipment found in modern aircraft. The term “avionics” was not used until the 1970s. For many years, aircraft had electrical devices, but true solid-state electronic devices were only introduced in large numbers in the 1960s. Airframe and engine maintenance is required on all aircraft and is not likely to ever go away. Aircraft instrument maintenance and repair also has an inevitable part in aviation maintenance. The increased use of avionics in aircraft over the past 50 years has increased the role of avionics maintenance in aviation. However, modern, solid-state, digital avionics are highly reliable. Mean times between failures are high, and maintenance rates of avionics systems compared to mechanical systems are likely to be lower. The first decade of avionics proliferation saw a greater increase in the percent of cost of avionics compared to the overall cost of an aircraft. In some military aircraft with highly refined navigation, weapons targeting, and monitoring systems, it hit a high estimate of 80 percent of the total cost of the aircraft. Currently, the ratio of the cost of avionics to the cost of the total aircraft is beginning to decline. This is due to advances in digital electronics and numerous manufacturers offering highly refined instrumentation, communication, and navigation systems that can be fitted to nearly any aircraft. New aircraft of all sizes are manufactured with digital glass cockpits, and many owners of older aircraft are retrofitting digital avionics to replace analog instrumentation and radio navigation equipment. The airframe and powerplant (A&P) maintenance technician needs to be familiar with the general workings of various avionics. Maintenance of the actual avionics devices is often reserved for the avionics manufacturers or certified repair stations. However, the installation and proper operation of these devices and systems remains the responsibility of the field technician. The history of avionics is the history of the use of electronics in aviation. Both military and civil aviation requirements contributed to the development. The First World War brought about an urgent need for communications. Voice communications from ground-to-air and from aircraft to aircraft were established. The development of aircraft reliability and use for civilian purposes in the 1920s led to increased instrumentation and set in motion the need to conquer blind flight—flight without the ground being visible. Radio beacon direction finding was developed for en route navigation. Toward the end of the decade, instrument navigation combined with rudimentary radio use to produce the first safe blind landing of an aircraft. In the 1930s, the first all radio-controlled blind-landing was accomplished. At the same time, radio navigation using ground-based beacons expanded. Instrument navigation certification for airline pilots began. Low and medium frequency radio waves were found to be problematic at night and in weather. By the end of the decade, use of high frequency radio waves was explored and included the advent of high-frequency radar. 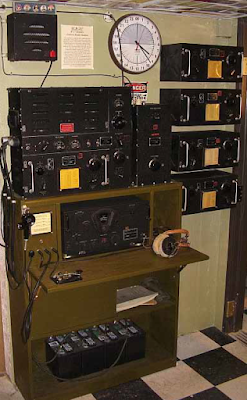 In the 1940s, after two decades of development driven by mail carrier and passenger airline requirements, World War II injected urgency into the development of aircraft radio communication and navigation. Communication radios, despite their size, were essential on board aircraft. [Figure 1] Very high frequencies were developed for communication and navigational purposes. Installation of the first instrument landing systems for blind landings began mid-decade and, by the end of the decade, the very high frequency omni-directional range (VOR) navigational network was instituted. It was also in the 1940s that the first transistor was developed, paving the way for modern, solidstate electronics. Civilian air transportation increased over the ensuing decades. Communication and navigation equipment was refined. 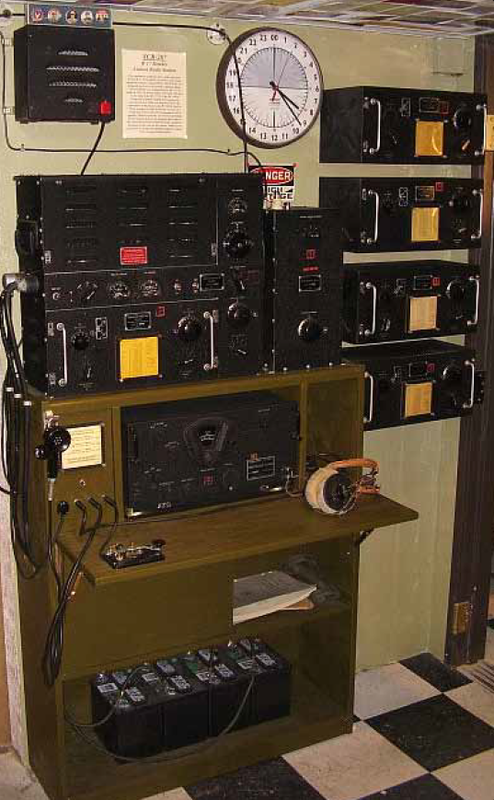 Solid-state radio development, especially in the 1960s, produced a wide range of small, rugged radio and navigational equipment for aircraft. The space program began and added a higher level of communication and navigational necessity. Communication satellites were also launched. The Cold War military build-up caused developments in guidance and navigation and gave birth to the concept of using satellites for positioning. 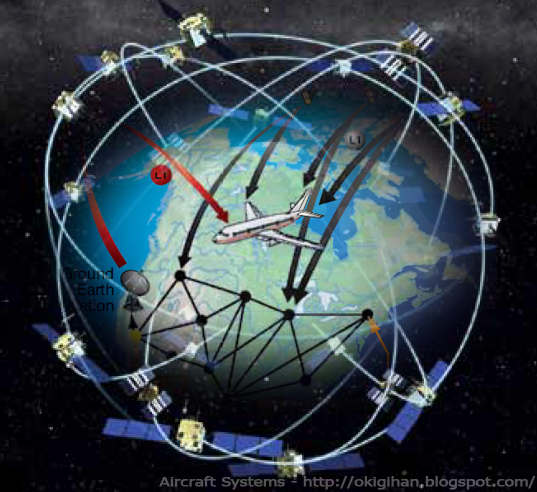 In the 1970s, concept-validation of satellite navigation was introduced for the military and Block I global positioning system (GPS) satellites were launched well into the 1980s. Back on earth, the long range navigation system (LORAN) was constructed. Block II GPS satellites were commissioned in the mid-80s and GPS became operational in 1990 with the full 24-satellite system operational in 1994. In the new millennium, the Federal Aviation Administration (FAA) assessed the national airspace system (NAS) and traffic projections for the future. Gridlock is predicted by 2022. Therefore, a complete overhaul of the NAS, including communication and navigational systems, has been developed and undertaken. The program is called NextGen. 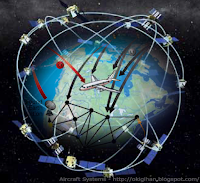 It uses the latest technologies to provide a more efficient and effective system of air traffic management. Heavily reliant on global satellite positioning of aircraft in flight and on the ground, NextGen combines GPS technology with automatic dependant surveillance broadcast technology (ADS-B) for traffic separation. A large increase in air system capacity is the planned result. Overhauled ground facilities accompany the technology upgrades mandated for aircraft. NextGen implementation has started and is currently scheduled through the year 2025. For the past few decades, avionics development has increased at a faster pace than that of airframe and powerplant development. This is likely to continue in the near future. Improvements to solid-state electronics in the form of microand nano-technologies continue to this day. Trends are toward lighter, smaller devices with remarkable capability and reliability. Integration of the wide range of communication and navigational aids is a focus. Electronic devices represent and manipulate real world phenomenon through the use of electrical signals. Electronic circuits are designed to perform a wide array of manipulations. Analog representations are continuous. Some aspect of an electric signal is modified proportionally to the real world item that is being represented. For example, a microphone has electricity flowing through it that is altered when sound is applied. The type and strength of the modification to the electric signal is characteristic of the sound that is made into the microphone. The result is that sound, a real world phenomenon, is represented electronically. It can then be moved, amplified, and reconverted from an electrical signal back into sound and broadcast from a speaker across the room or across the globe. Since the flow of electricity through the microphone is continuous, the sound continuously modifies the electric signal. 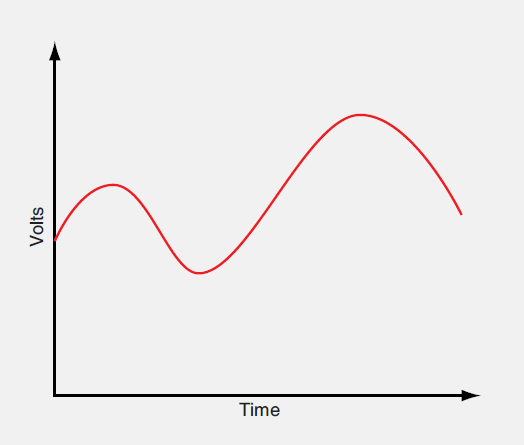 On an oscilloscope, an analog signal is a continuous curve. [Figure 2] An analog electric signal can be modified by changing the signal’s amplitude, frequency, or phase. A digital electronic representation of a real world event is discontinuous. 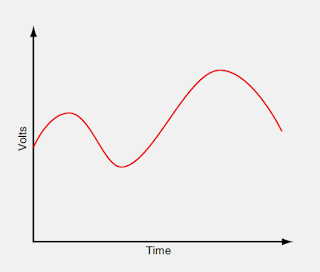 The essential characteristics of the continuous event are captured as a series of discrete incremental values. Electronically, these representative samplings are successive chains of voltage and non-voltage signals. They can be transported and manipulated in electronic circuits. When the samples are sufficiently small and occur with high frequency, real world phenomenon can be represented to appear continuous. Early aircraft were equipped with radio communication and navigational devices that were constructed with analog electronic circuits. They used vacuum tubes that functioned as electron control valves. These were later replaced by solidstate devices. Today, digital electronic circuits dominate modern avionics. In-depth maintenance of the interior electronics on most avionics devices is performed only by certified repair stations and trained avionics technicians. The airframe technician is responsible for installation, maintenance, inspection, and proper performance of avionics in the aircraft. Modern aircraft increasingly employs digital electronics in avionics rather than analog electronics. Transistors are used in digital electronics to construct circuits that act as digital logic gates. The purpose and task of a device is achieved by manipulating electric signals through the logic gates. Thousands, and even millions, of tiny transistors can be placed on a chip to create the digital logic landscape through which a component’s signals are processed.